As ardent proponents of positive reinforcement training methods for dogs, we at Puget Sound Puppers have taken a strong stand against the use of aversive training tools such as shock, choke, and prong collars. Why is this so important? What are the dangers of using tools such as these? 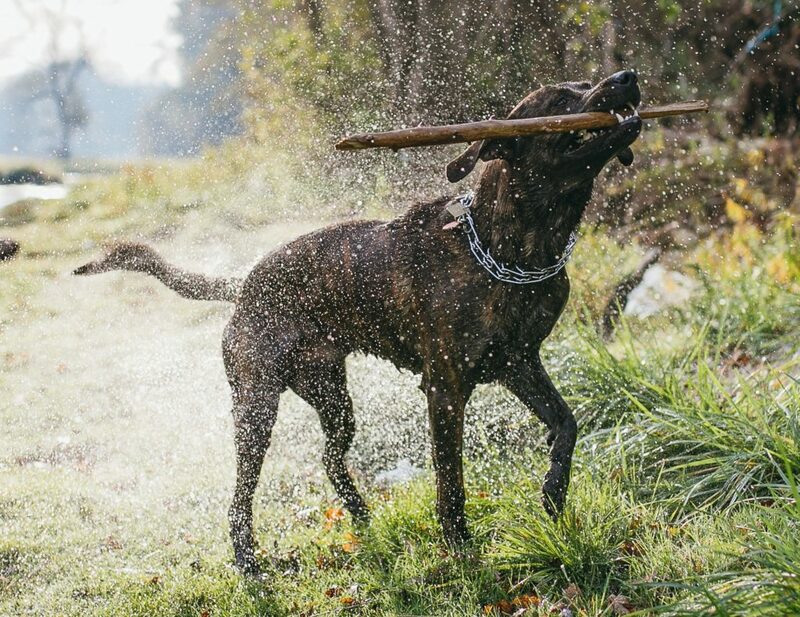 Training tools that cause discomfort have been used for many years in accordance with the Alpha Dog training theories that have been recently debunked by animal behaviorists, schools of veterinary medicine, and pet professionals alike. The prevailing idea behind the Alpha Dog theory is that dogs are hierarchical, pack-based animals that have evolved to use aggression to become either the “Alpha” of the pack or accept a more submissive role within the group. When humans use painful collars on their dogs, this theory poses that they are asserting their dominance in the “pack structure” and deterring unwanted behaviors, such as pulling on leash or barking. There are two problems inherent in this approach, however. The first is that punishment (through painful training tools) is not an effective training method. While aversive training may stop the pulling or suppress a certain behavior at that particular moment, it does nothing to address the root of the dog’s issue. As we previously discussed in The Importance of Positive Reinforcement Training for Dogs, positive reinforcement methods are more successful than aversive methods in increasing the probability that your dog will repeat desired behaviors. The second problem is that aversive training tools often cause lasting medical issues that can decrease your pet’s health and overall quality of life. A more extreme version of the typical choke collar, the prong collar is a metal chain outfitted with spikes on the inside of the collar. When the handler pulls or jerks back on the leash, the metal chain tightens and drives the spikes into the dog’s throat causing pain and discomfort. The more the dog struggles against the force of the handler’s movements, the more the spikes are embedded. As you can imagine, this can cause a variety of issues. In the short term, it may cause whiplash, fainting, and bruising of the esophagus, skin, or neck tissue. It may even cause bone fractures, dislocated neck bones, spinal cord injuries, or crushed tracheas if fast, jerking movements are used. Extended use of prong collars, however, can prove to be much more damaging. Spinal cord injuries may lead to paralysis, and continued pressure on the neck may lead to brain damage and prolapsed eyes. Overall, the use of training tools meant to cause discomfort (like prong collars) are often ineffective, counterproductive, and downright damaging. As pet professionals and advocates of positive reinforcement training techniques, we require that all of our walkers not use such tools and discourage our clients’ use of them as well. If you’re interested in learning more about positive reinforcement training, please reach out to us! A proper prong collar does not cause pain. It simulates a corrective nip that a mother dog might give her pup. I was very against these collars until I was trained on how to choose and utilize one by a reputable trainer. Furthermore, I have used it on myself several times to verify this. On my bare human skin there isn’t the slightest pain; with fur, even less so. Properly used, the prong collar is an effective and painless training tool that fits well in a positive reinforcement program. Do you have any evidence to back up the claim that a dog relates the “nip” of a prong collar to the “nip” of a mother? And if it doesn’t cause pain or discomfort, then please explain how a prong collar discourages an unwanted behavior? I should add that a good prong collar includes a detente ring that prevents overtightening, so there is never, ever a chance of trachea damage.